Whether you're learning to sew for the first time or are ready to pick back up a long lost hobby; Intro to Modern Sewing is the perfect class for you. Intro to Modern Sewing will cover everything you need to know to sew with confidence. From threading your machine to completing three fun and exciting projects! Our expert teachers have years of experience and are able to answer all your questions and help you develop good sewing habits. Over the course of four weeks you will complete three fun, modern projects that will teach you all the basic skills you'll need to continue exploring your new love of sewing. A standard size pillowcase - perfect for sprucing up your bedroom decor or giving as a gift. This project will teach you to accurately measure large pieces of fabric, how to sew a french seam, work with a given seam allowance, sew together multiple layers of fabric, and help you build confidence working with a sewing machine. 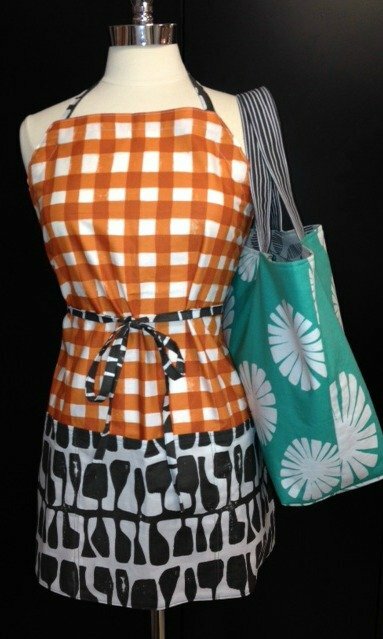 An adjustable apron - featuring a large pocket in the front this apron is perfect for sewing, crafting, cooking and any other slightly messy endeavor you have your heart set on. Completing this project will teach you to make double fold binding, edge and top-stitching, and how to sew around a corner. The essential tote bag - just the right size bag to carry everywhere. Fully lined and featuring two interior pockets (one zippered), this tote is just the bag you've been dreaming of. By the time you have finished your tote you will know how to apply two types of fusible interfacings, insert a zippered welt pocket and box the bottom corners of your tote for a professionally finished look. Cost: $125 for the four-week course. This course requires a book and supplies which will need to be purchased at The French Seam as well. The French Seam provides sewing machines and basic sewing notions to use during the class. We provide sewing machines for class use. You will need to purchase your book and supplies prior to the first class. Class book and supplies must be purchased at The French Seam. This course requires a book and supplies which will need to be purchased at The French Seam.